What is the Manga Comparison Project? Since its initial release in the February 1992 issue of Nakayoshi, the Sailor Moon manga has gone through four major reprints in Japan – the original Nakayoshi print, the compilation tankobon print (early 90s), the re-mastered ‘shinsoban‘ reprints (early 2000s), and the ‘kanzen‘ (early 2010s). What you may not know, though, is that Ms. Takeuchi has made changes to the art and text with each release. This project is dedicated to compiling a list of what’s changed with each release to help us better understand how Sailor Moon has evolved over its past 25 years. While many of these changes are minor, I think they’re worth pointing out since Ms. Takeuchi felt it was worth making these changes. Please note, though, that when a change is made in one version and is retained in the rest, I will only point out the version when the change is made. Lastly, I’d like to thank my kind Patreon subscribers who help make this, and other side projects, possible. These comparisons go up 1 month early on Patreon, so it you’re interested in being involved, please check it out! Note: There were few differences between the Remastered and Perfect editions, so for the sake of simplicity, I will only discuss the Perfect version when there are changes. Also, I didn’t bother to point out non-substantive changes, such as Ami’s name being changed throughout from hiragana (あみ) to kanji (亜美) in the transition between the Original and Remastered, as well as changed or rewritten sound effects. 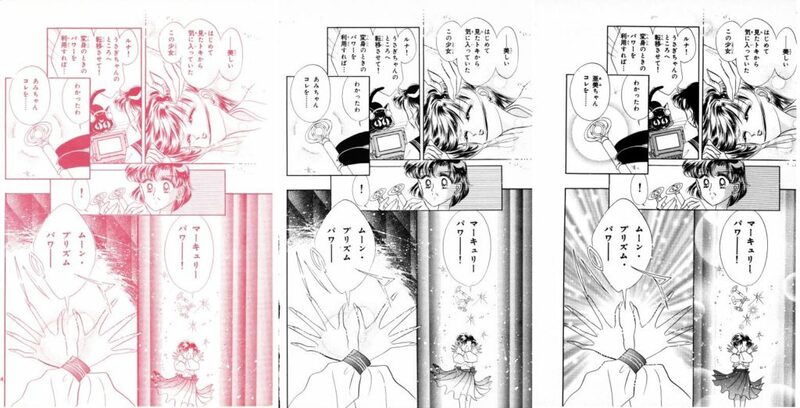 As we’ve already seen in previous issues, it seems that Naoko doesn’t really make any changes to her color artwork, with the exception of some unnecessary updates in the Remastered version of Act 1. 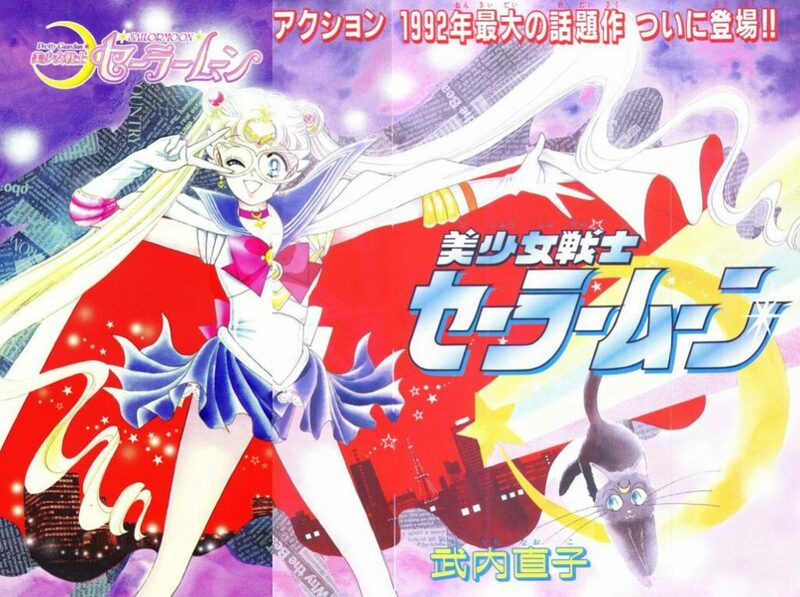 As an aside, though, I really like how this picture showcases that Sailor Moon’s design wasn’t finalized for quite some time (note the yellow arm bands and boot colors). Also, this image really drives home that her boots are inspired by an ice skater’s boots. Nice to see! 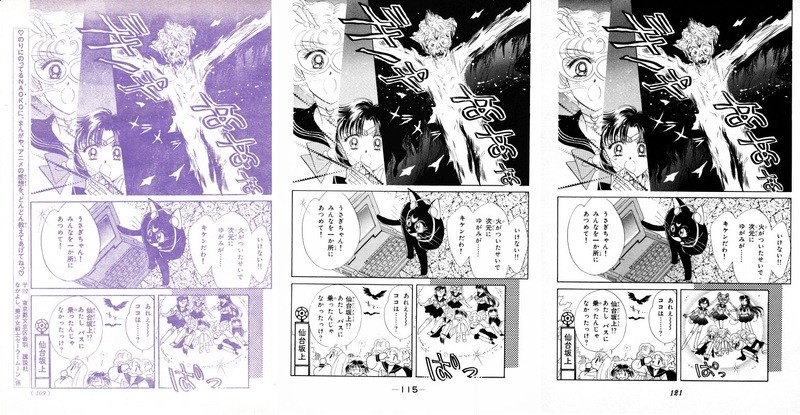 The most obvious change between the Nakayoshi to Original releases is that the Original removed the story summary (explaining what happened in the previous Act and introducing our cast of characters) and filled out the missing parts of the page. To be honest, I’m not sure if it was added in later, or if this “Last time on Sailor Moon…” box just cut out the material. If you look at these three panels, they have no bottom border, which is a bit weird. In the Remastered version, Queen Beryl’s design has been updated a bit (she’s a little slimmer up top and her face has been redrawn a bit), some dark borders added to the top and bottom, and there’s some more definition in the background behind Jadeite to the left. 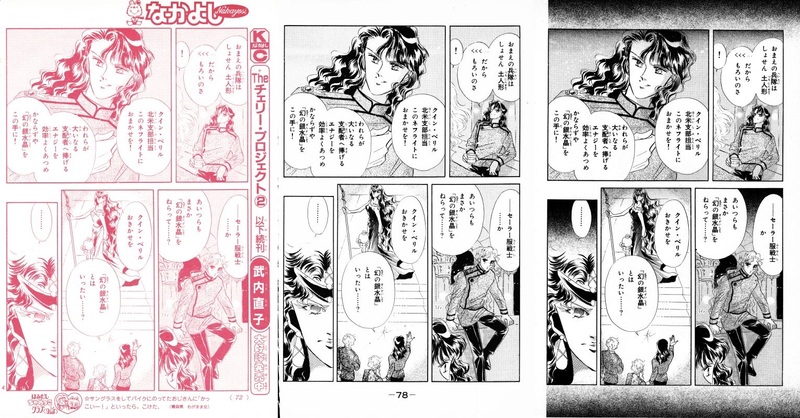 Very minor changes on this page, with Nephrite getting some more hair in the top-left panel and shading being filled out in the bottom-right from the Remastered edition. Also, more of that tacky black spray-paint effect throughout to make the Dark Kingdom… dark. Once again, only minor changes from the Remastered version, with the right-panel being redone and the border over Queen Beryl’s head at the top left being replaced with that “awesome” black spray paint. Quite a few small changes here in the Remastered: The shrine in the background in the top-left panel is redrawn and more detail added to the girls’ uniforms, the bus and the background behind it have been cleaned up (shading added? ), and Mii-chan’s bizarre claw-like hand is now cut off at the middle panel, so it looks less bizarre and claw-like. 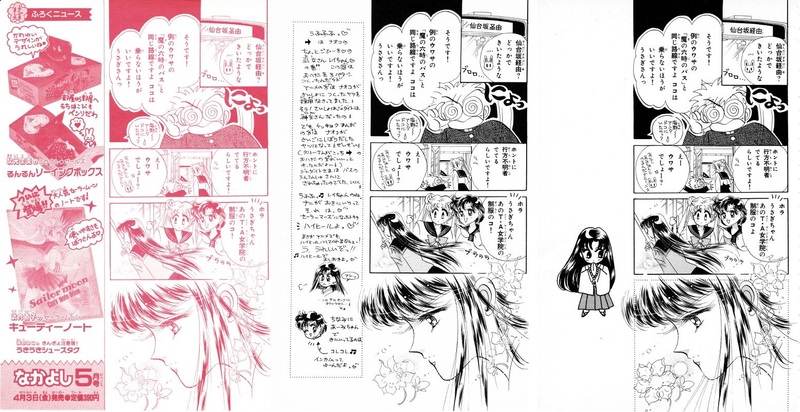 Starting from the Original edition, there were a few small changes, such as a background being added behind Rei’s face in the top-left, and black shading behind her hand in the lower-right. By the way, look at that pinky. Ouch! Surprisingly, no further changes as further editions were released. Wow, looks like Naoko was taking a day off with this issue. 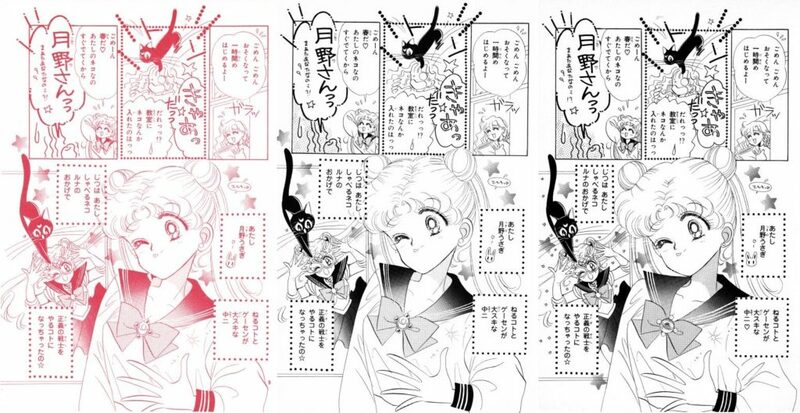 In the Original, Usagi’s been filled out a bit (the bottom of her uniform wasn’t drawn), and Luna’s was updated in the Remastered edition in the middle and bottom-left panels. Starting with the Original version, a screentone was added over Haruna in the top-left to add some shading to her. For Usagi, her odango and hair have been redrawn in the bottom panel to give them more volume and make the odango more round. In the bottom-left panel, the jewels were colored in. Also, the decorative background stars have been moved around, some tiny ones added in behind Sailor Moon, and Sailor Moon’s right leg has been drawn in. 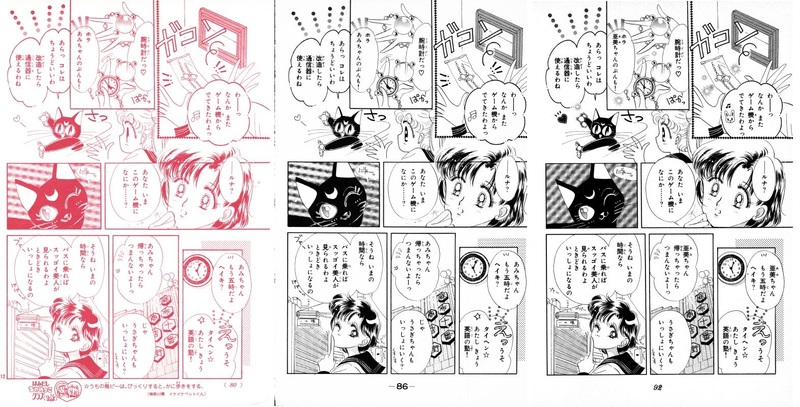 There are only three small changes on this page, starting in the Remastered version: the Crown Game Center has been totally redrawn in the top-right panel, Sailor Mercury’s bow has been changed from grey/colored-in to white, and the controls on the arcade games are made more detailed in the bottom-left panel. 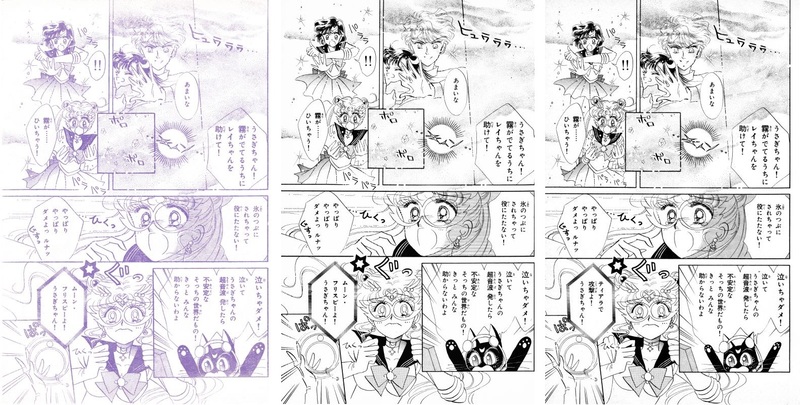 Edited to add: two observant readers pointed on that, also in the Remastered, Usagi’s makeup under her left eye in the center panel has been touched up and Ami has been given her choker, that Naoko seems to have forgotten up until then. Thanks Lauren and Manuel! Starting with the Original, Luna’s head in the center panel is slightly redraw – specifically her ears. Once we get to the Remastered version, Luna’s body is also redrawn. Further, there were some design edits to the top-right, top-center, and middle panel regarding their backgrounds. Finally, Usagi’s right odango was missing, so it was finally added from this version in the bottom-center panel. The border around Ami in the lower-right has also been updated. 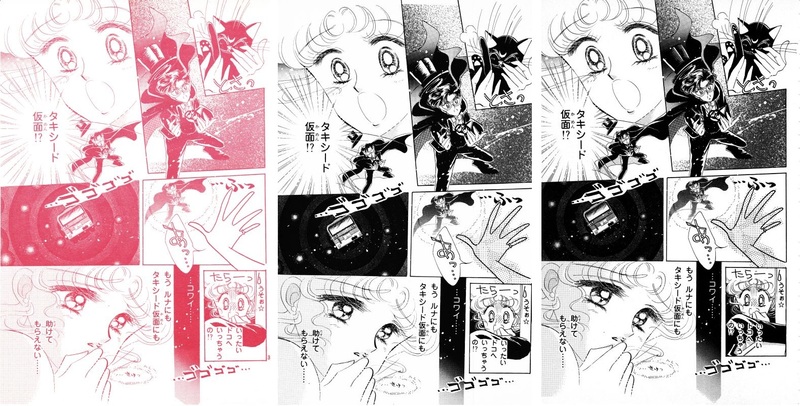 As an aside, you know, I totally forgot that Luna actually modified the watches to be communicators in the manga. I always assumed they were magical communicators from the start, like all the other magical items. Weird. In addition to the typical changes to make use of advertising space (which was turned to liner notes in the Original and a cute Rei sketch in the Remastered) there are a few other small changes. From the Original, the word バス (basu; bus) has been added to the middle panel (next to the rabbit) to give extra context. 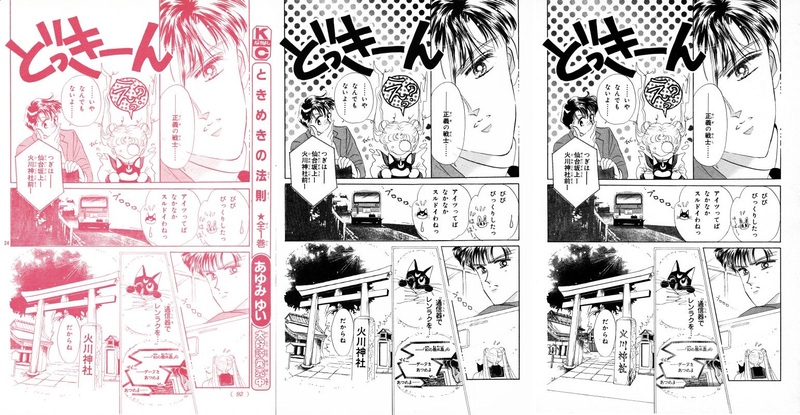 In the Remastered edition, the rabbit in the top-right panel has been redrawn, Umino’s head and hair are cleaned up, and in the middle panel again Umino has been updated (including his spiky hands) to look less like a monster. In the same panel, Usagi’s school uniform has been updated to add the bow at her lower back, and in the panel below that, Usagi’s odango and shoulder have been cleaned up. Ami, to her right, has had her bow added as well. Finally, at the very bottom, the flower in front of Rei’s face has been redrawn. 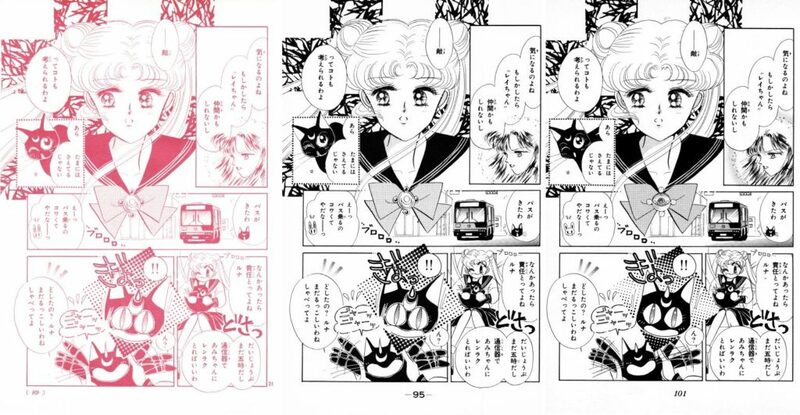 From the Original, you can see in the top-center panel that she forgot to add in the bus sign, which is now there, in addition to a screentone being put over Usagi trying to murder negotiate with Luna. Moving on into the Remastered edition, the glowing bubbles have been changed to hearts in the top-right panel. In the top-center, there’s a very minor change to the background behind the bus, and in the top-left Luna has been redrawn and the bus updated to makeup for Luna being moved. Usagi’s face is also slightly revised, and a tree added behind her in the same panel. In the center panel, the entrance to the Hikawa shrine has been completely redrawn, which looks pretty nice. Finally, Luna’s face at the very bottom has been cleaned up a bit. 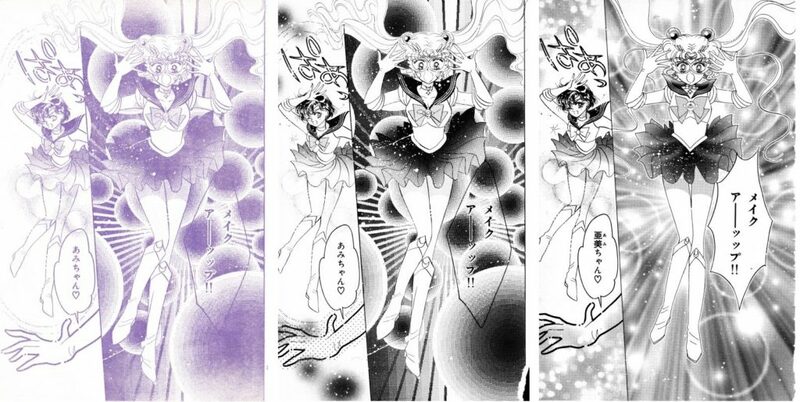 In the Remastered edition, Rei’s pose in the top-right panel has been changed quite a bit. In the original, it looks like she was kneeling, but now she’s standing and seems like her heart-rate has picked up. Below that, when Usagi is being attacked, some trees are added to the background and her bow is now colored. Read also: What Information Did Naoko Share With American Sailor Moon Fans? 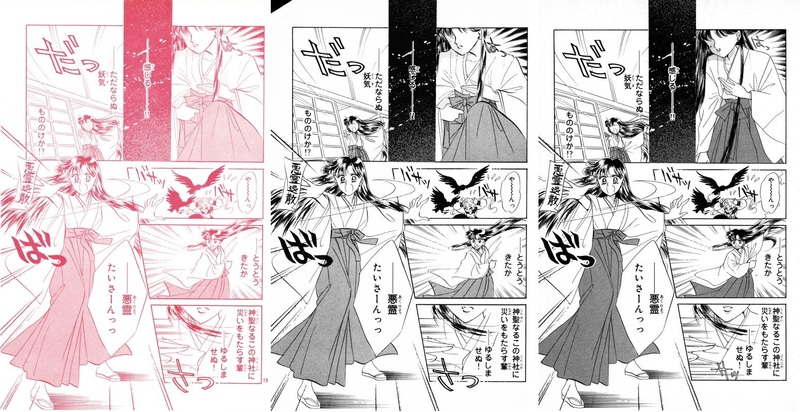 Other than that, her left sleeve has been redone in the top-left panel, her sleeves and hair redone in the middle right panel, the ofuda slightly redrawn in the lower-right panel, and in the left-panel, her left sleeve and the ofuda have been touched up. Minimal changes on this page. 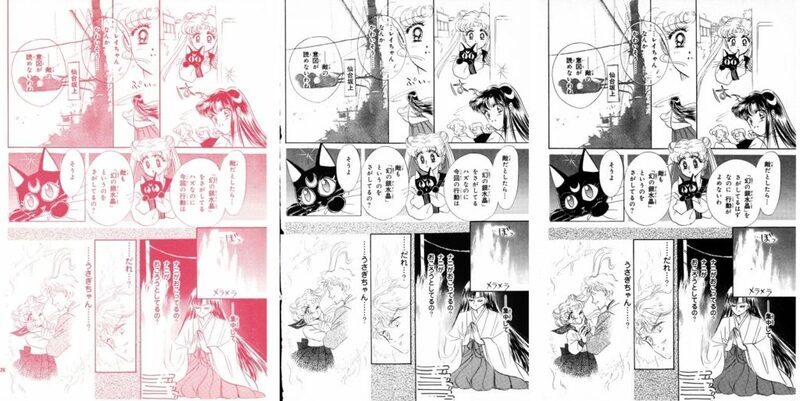 From the Original edition, the only change was adding a screentone over Luna and Usagi on the middle panel. From the Remastered, Usagi’s hair has been updated in the top-right panel, and some stars were added over her odango, in addition to the bunny in the top-center being redone. Only a few minor changes in the Original version, which include shading and cleanup being done to the shrine in the top-right, some… grey blobs being added behind the woman in the panel in the center of the page (presumably these are parts of the shrine in the background?) and some more shrine cleanup/shading in the lower right, behind Rei and Usagi. I guess this is to make it clear that the shrine isn’t run by Rei’s father? Ever look at a page and then guess what’s going to change? I’m pretty sure you can probably figure out what’s going to change here just at a glance, but I’ll still go through it, just for fun. 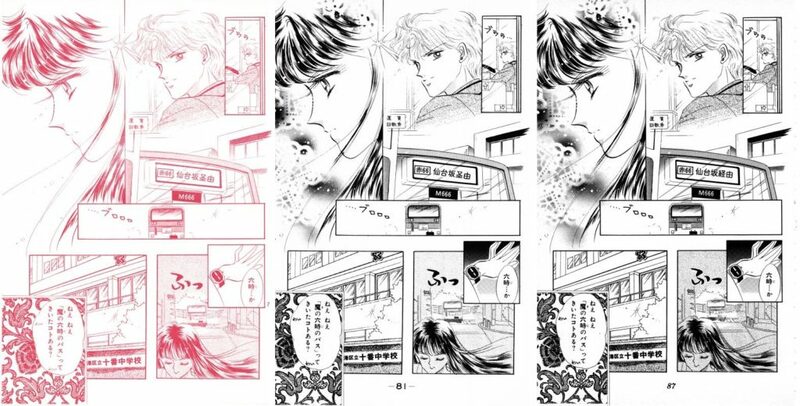 First off, from the Original version, the street sign in the lower-right panel was updated, because it was unreadable in Nakayoshi (looks like it was taken from a photo). 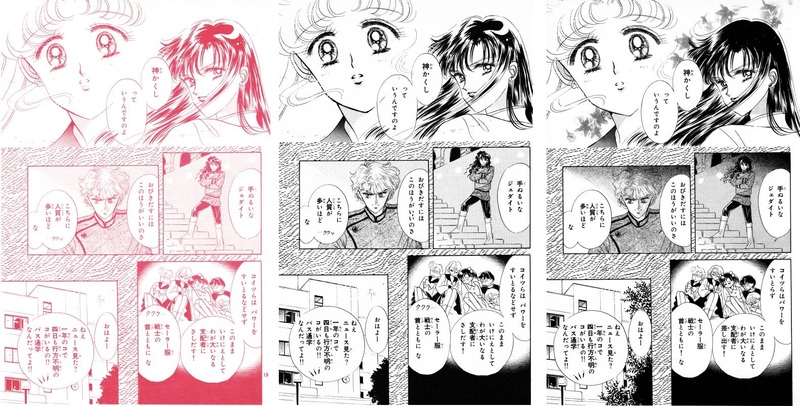 From the Remastered edition, Rei’s hair was slightly cleaned up in the top-right panel, Luna was redone in the top-left and in Usagi’s arms, and Usagi’s hair, face, and left arm were redone. Surprisingly, her brooch was left alone! One small change from the Original, with a wisp of hair being added to the right of Usagi’s face. Once we move into the Remastered, Rei’s hair gets more filled out and colored in, with some flowers added between her and Usagi. 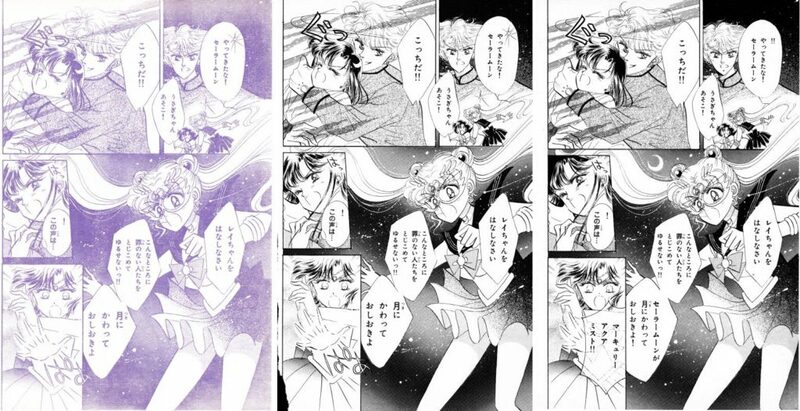 In the same panel, Usagi’s mouth is slightly redrawn. Once we get to the Dark Kingdom, we’re back to Naoko’s favorite new spray-paint tool, adding black shading to the top of every box. Closing out our visuals, the girls’ designs have been cleaned up, and a tree has been added to the lower-left panel. 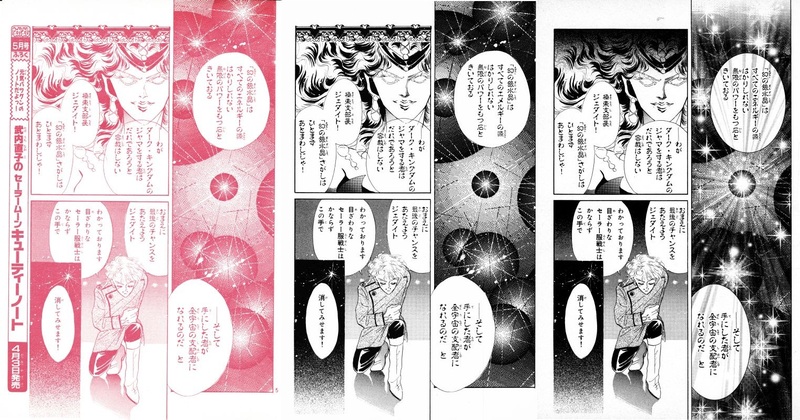 As for text changes, Jadeite’s evil cackle has been removed from two speech bubbles (why??) and there were two small text changes in the lower-right panel. However, there’s no change to the meaning. Maybe Naoko felt the “or anything like that” sounded kinda creepy coming from two men talking about kidnapped girls? this could have been a comment by Usagi (insinuating Luna’s heavy?) but removed due to the rudeness of the comment? There’s something about this page I just absolutely love. I can’t put my finger on it, but it’s just so absurd and shows Naoko’s penchant for comedy. But anyway! No changes in the Original version, but several from the Remastered. 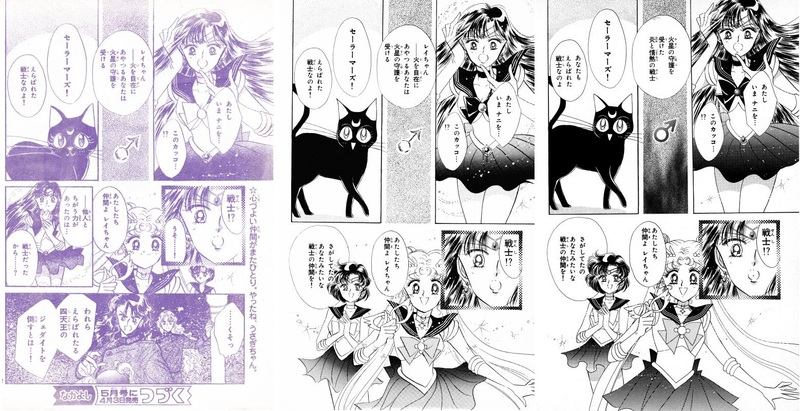 These changes include changes to Luna in the top and bottom panels, Mamoru’s hair is filled out in both panels, the street view behind the bus in the top panel is filled out a bit more, stars are added to Usagi’s text in the middle-right panel, and her skirt is colored-in in the middle-left. Finally, Mamoru’s ID has been changed a bit, with the logo in the top right changed and a background added behind his photo, in addition to Usagi’s bow in the bottom panel getting colored in. Huh, looks like we’ve got a few errors here in the Nakayoshi release, which were later fixed in the Original version. 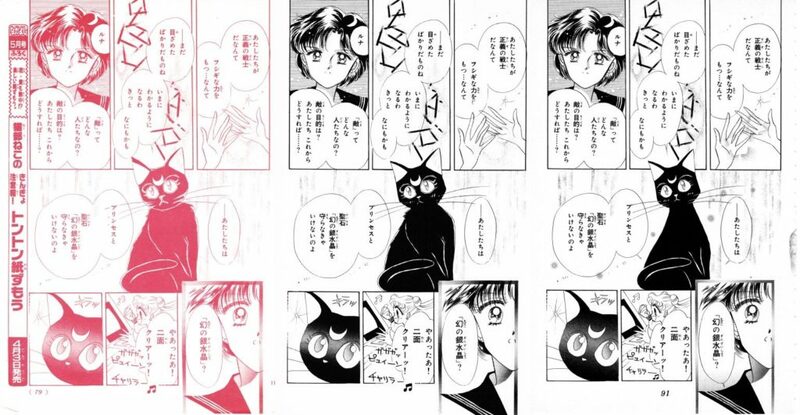 Specifically, the collar of Usagi’s uniform wasn’t originally colored in, and Mamoru (in the top-left) had white backdrop behind his head, which cut off the background (probably a layering issue. 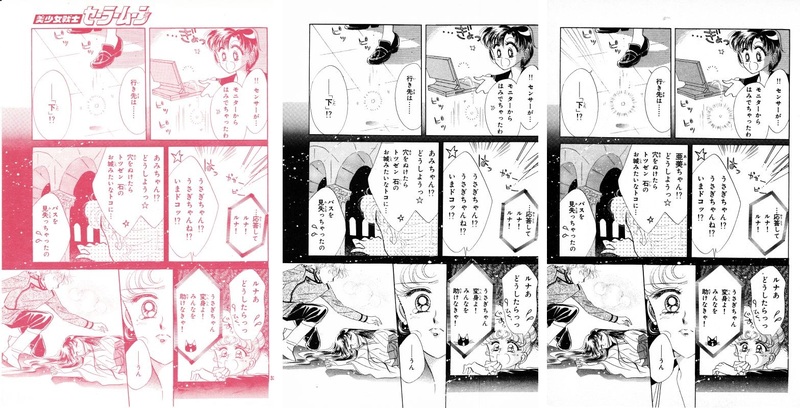 Onto the Remastered edition, Mamoru’s hair in the top-left is cleaned up a bit (shading), the background behind Usagi in the middle panel has had the contrast kicked up, proper bubbles were drawn around the text in the lower-right panel, and some more of those… light… bubbles (?) Naoko is so fond of were added to the lower-left. As we move into the Original release, there was one addition – a polka-dot background added to the top-left panel. 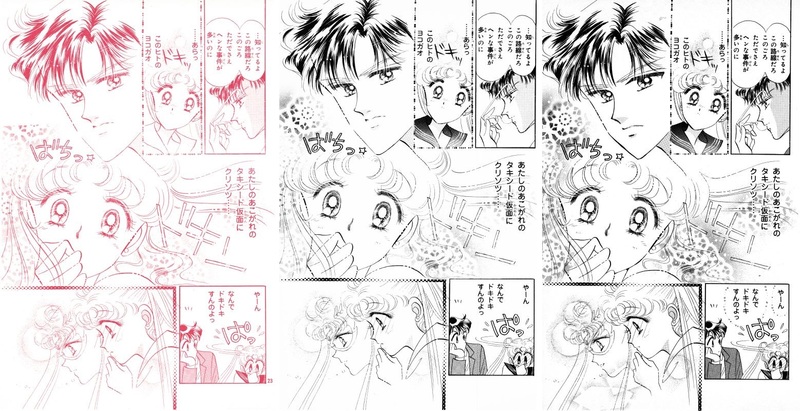 In the Remastered, Usagi’s shoulders are cleaned up in the top-left to make them less billowy and Mamoru’s hair is filled out and cleaned up a bit. In the middle panel, the rabbit and Luna icons (denoting the speaker) have been touched up. 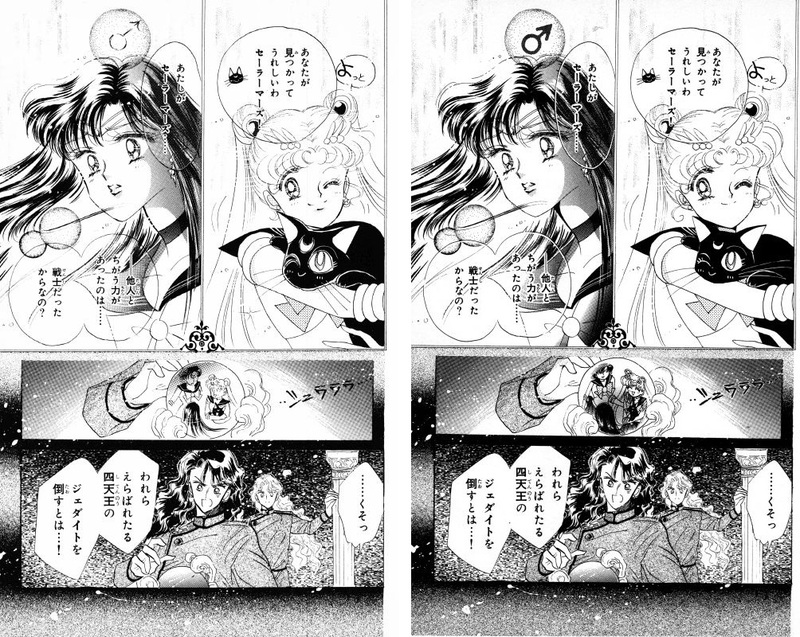 Finally, at the bottom, the scene at the computer with Luna (in the bottom-center panel) appears to be updated slightly – specifically the textbox outlines and the computer screen – and in the bottom-left, the Hikawa shrine background has been redrawn and the marker at the gate redone. the text in the top-right pane was re-written… kinda. Basically, the words are the same, but the way they were written has changed, much like Ami (あみ to 亜美). Specifically, ウチ became うち (uchi; my/my family) and ムスメ became 娘 (musume; daughter). still in the bottom-center panel… wow, some text re-writes! in the Original version and earlier, the concerned mother accuses Rei of doing some sort of bizarre Shinto ritual, but this has had some text added to it in the Remastered version and the mother notes that she hasn’t seen Rei’s grandfather around lately. Only one, tiny change in the Original version: Luna gets a mouth in the middle, right-hand panel. Yay! Starting with the Remastered edition, we have a few changes. First off, Luna has been cleaned up in nearly every panel… as she should be. In the top-right, Usagi’s hair has been cleaned up (specifically, her right odango and left pigtail) and the background has been cleaned up a bit. (If she’s an enemy…) she must be looking for the silver crystal, I can’t get a sense for what she’s doing. This rewrite makes sense, and honestly even in Japanese Luna’s thought sounds incomplete (which is usually okay in Japanese but even here it’s pretty bad). 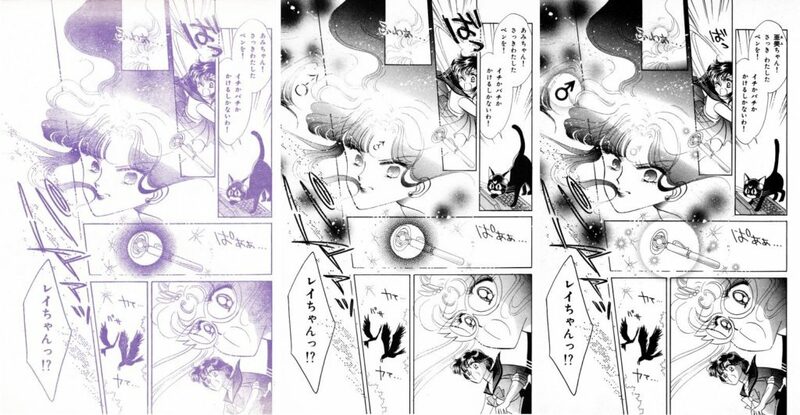 Finally, Jadeite goes from… caressing Usagi’s cheek (?!) in the bottom-left to full-on choking her. I don’t know which is better, but I guess no one asked my opinion. Wow, very few changes here. From the Remastered version, Usagi’s speech is revised ever-so-slightly (モノ (mono) added), but it doesn’t change the meaning. 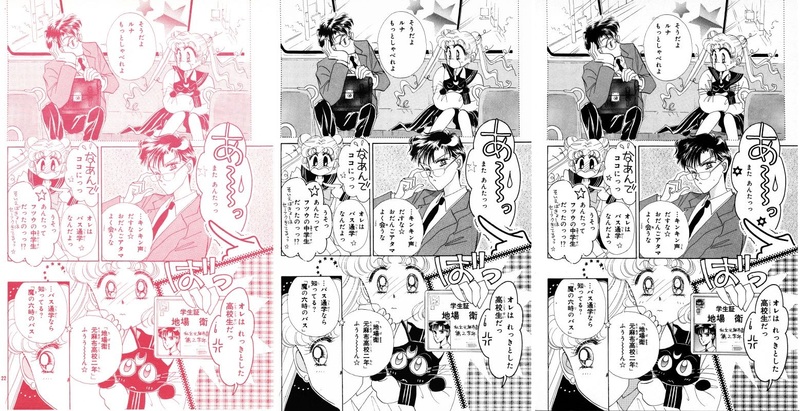 Other than that, in the top-left panel, Tuxedo Masks’s had has been colored in to remove some of the shine. Finally, in the lower-left, the bus has had some shading added. Yet another page that seems to have few revisions. 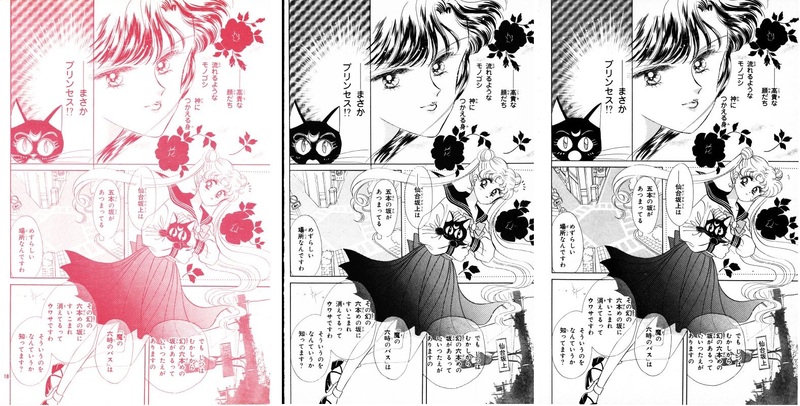 The only two that stand out to me are the change to the top-left panel in the Remastered edition, where the surprise lines have been added around Rei’s head and her panel properly squared off, as well as the change to Luna in the lower-left. Her face is touched up a bit, and the left text bubble now covers her ear. Read also: Who Saved Ami From Becoming a Cyborg? Starting with the Remastered, Usagi’s eyebrows have been changed in the top-left and, in the bottom-center, Usagi’s text has been removed to show the action off better. Also throughout the page, there are some glow bubbles, etc. added around the Disguise Pen that Naoko was so fond of at this time, together with some changes to the white marks on Usagi’s skirt on the right. Once again, we’ve got a page that changes quite a bit across the generations. 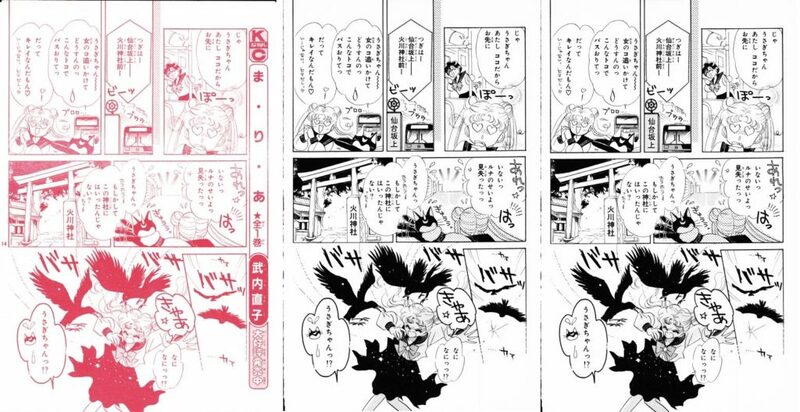 From the Remastered edition, the top panel has been changed to show a different transformation design… but probably more noteworthy is that Usagi’s text at the very top has been straightened out and rewritten, saying 「スチュワーデスにへんしーんっ！」(“Transform into a stewardess!”) in the Original to 「スッチーにチェーンジ！！」 (“Change into a succhi [shorthand for stewardess]! !”) in the Remastered. Luna has been revised in the lower-right (specifically her tail) and some more glow bubbles have been added around the page. What’s even more interesting, though, is that this was revised yet again in the Perfect version: Usagi now says 「CAにチェーンジ！！」 (“Change into a CA! !”; CA being an abbreviation for “cabin attendant”) and Luna’s text in the lower-right has also been updated to reflect this. As for how and why this happened, your guess is as good as mine. My guess for removing “stewardess” is probably due to changes in Japanese society and wanting to remove the gendered nature of the term. Across the board, CA is the term used everywhere nowadays, so it makes sense. I’d really like to know why the succhi shorthand was added in the Remastered version. The only thing I can think of is that it was Naoko’s original attempt to get around the gendered term and choose something that applies to both stewardesses and stewards, but since the term succhi is no longer used, it had to be removed. Incidentally, the uniform – or at least the hat – seems to be based off of All Nippon Airways’ (ANA) then-current uniform. See here. 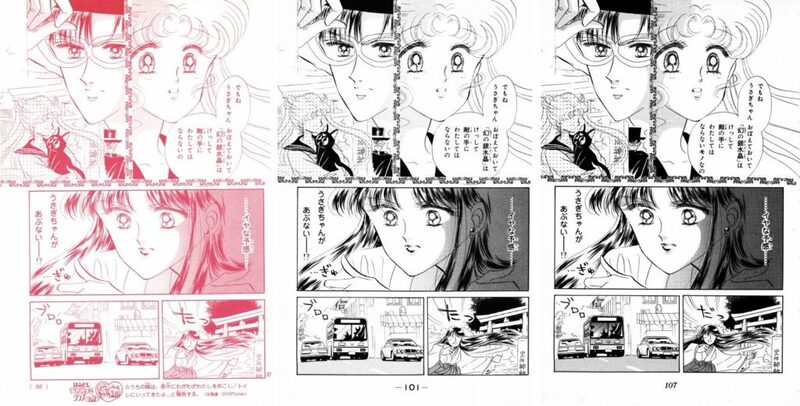 Only two small changes I can see in the Remastered version here: Tuxedo Masks’s hat in the top-right panel gets colored in to remove the harsh reflection, and the white box with behind the text in the lower-right has been removed to draw in more of Usagi. Lots of small changes here. Moving into the Original edition, some design elements have been added behind Tuxedo Mask’s text and under his chin on the right-hand panel. From the Remastered, Luna has been touched up in every panel to make her look less like an ink blob on paper and more like a cat. 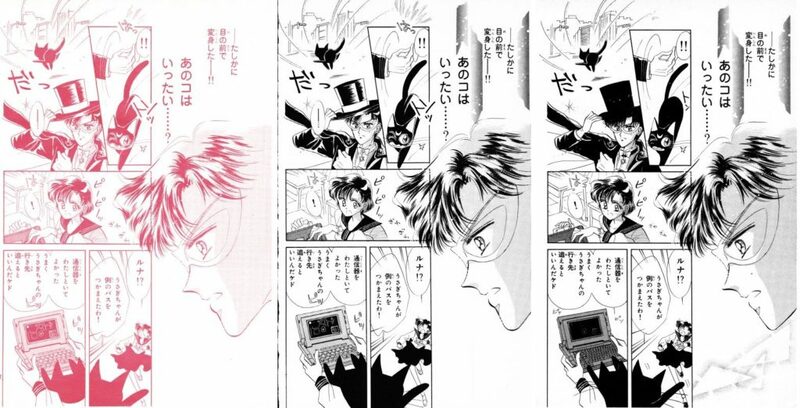 Also, in the top-left panel, once again Tuxedo Mask’s hat and clothes are shaded in. Lastly, Ami’s computer gets updated… for whatever reason (it still looks old). I know I don’t usually do commentary on the stories here, but I absolutely love this scene for its absurdity, where the blip Ami is following literally drops off the screen and onto the floor. It reminds you that this really is a children’s story. As far as changes go, once again, very minor. In the Remastered, there’s a very minor change to the bottom-right panel: the Luna icon has been changed ever-so-slightly (the whiskers?) and Usagi’s hand in the foreground redone. Wow, Luna’s headphones in the top-left… fancy. There are a few changes in the Remastered version, which includes adding shading to Ami’s hair in the top-left, redrawing the glow around the transformation pen also in the top-left, redrawing the backgrounds behind Ami and Usagi’s transformation panels at the bottom, and also redrawing Ami’s skirt in the bottom-right (mostly shading). From the Original, a change was made to Ami’s panel on the left, adding a background and a screentone over Usagi’s hand. Once we move into the Remastered edition… wow! Usagi is totally redrawn. While the brooch in particular stands out, another big change in her basic design is the… um, low-cut collar on the original Sailor Moon design. You can still see this on Mercury, since she wasn’t redrawn. 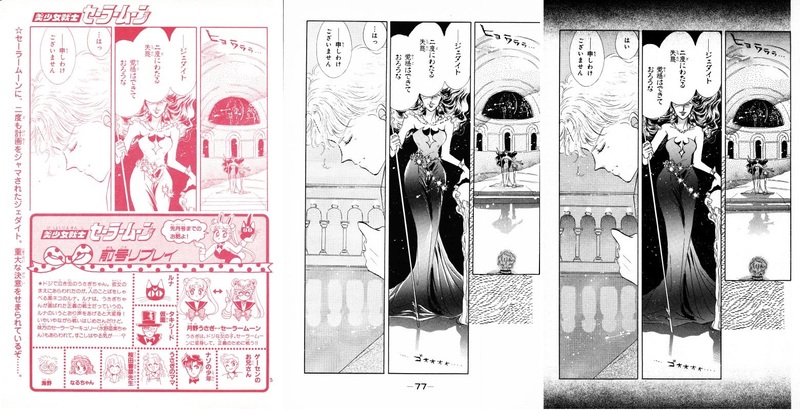 The screentone was removed from Usagi’s hand in the left panel and the backgrounds in both panels redone. Wow, Jadeite… choking a 14 year old girl? There are a few changes from the Remastered edition on this page. 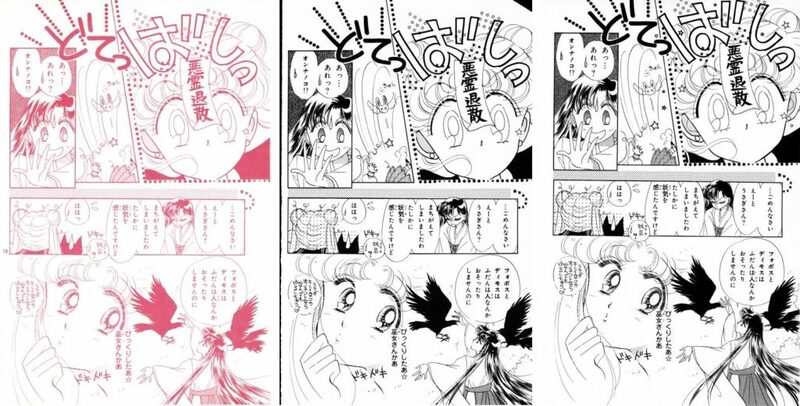 Namely, Sailor Moon’s design has been cleaned up in the top-right and lower-right panels. In the lower-right, specifically, her odango have been moved and hair touched up, her chest size… umm… reduced, a moon added to the background (which is kinda weird when you realize that this is underground), and in the lower-left text bubble, Usagi’s speech has been changed to read “I, Sailor Moon…” instead of just her phrase about punishing in the name of the moon. Not one to be left out, Rei’s hair is shaded for both of her panels to remove the glossy reflection. Also, Mercury’s attack phrase (Mercury Aqua Mist!) has been added to the lower-left, where she didn’t call out her attack in the Original. Ooh, a few small changes from the Original version for once! The “Moon Frisbee” text in the upper-right balloon has been adjusted so it’s no longer diagonal, and it also looks like she forgot to color in the odango ornaments and include the feather hairpins in the Nakayoshi release. Also, Usagi’s hair is redone a bit in the top-right. 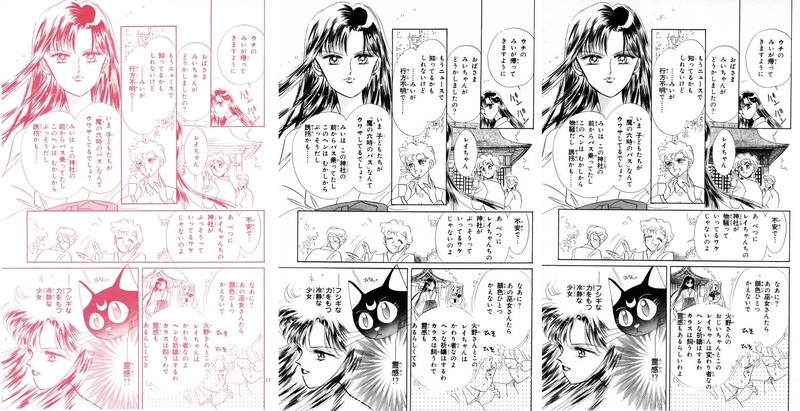 Continuing with the Original, some motion lines have been added to the bottom-right panel with Jadeite. Starting with the Remastered edition is when things get interesting again. 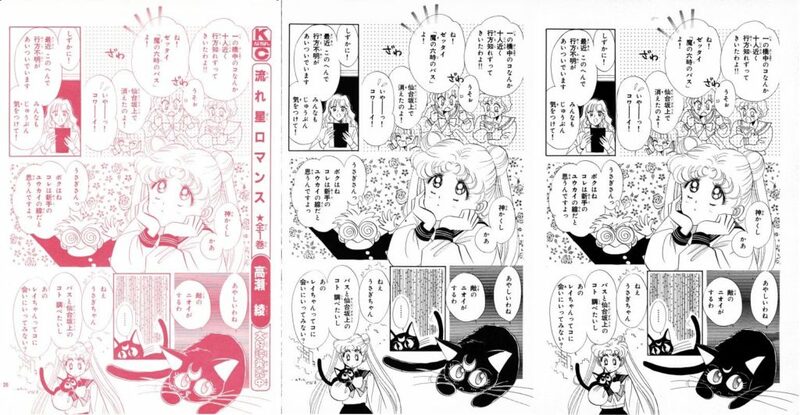 Usagi’s text ha been changed to “Moon Tiara Boomerang,” and her hair has once again been touched up in the top panel, specifically moving her odango up. The Moon Tiara Boomerang has also been redrawn, which is kinda obvious, since it sticks out like a sore thumb. Finally, emphasis lines and more motion lines have been added to the Jadeite panels in the top-left, bottom-right, and middle panel beneath the boomerang. 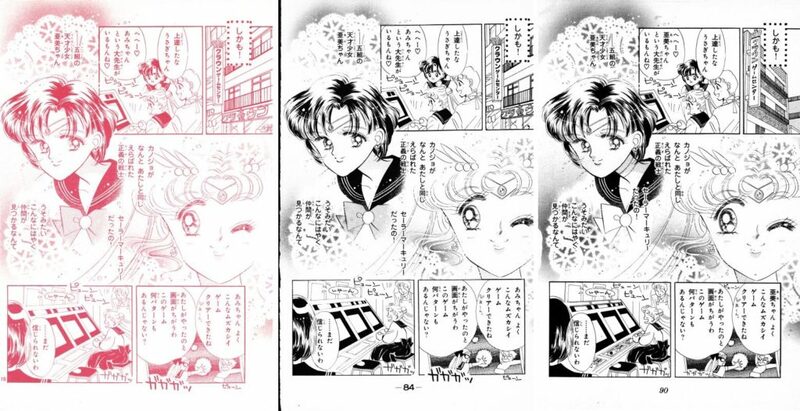 In the bottom-left, Ami, Usagi, and Rei’s hair have all been touched up a bit. And yet more changes from the Nakayoshi version! The Mars symbol was added to Rei’s forehead as well as to the top-left of the page. Some background decorations were also added to the page. 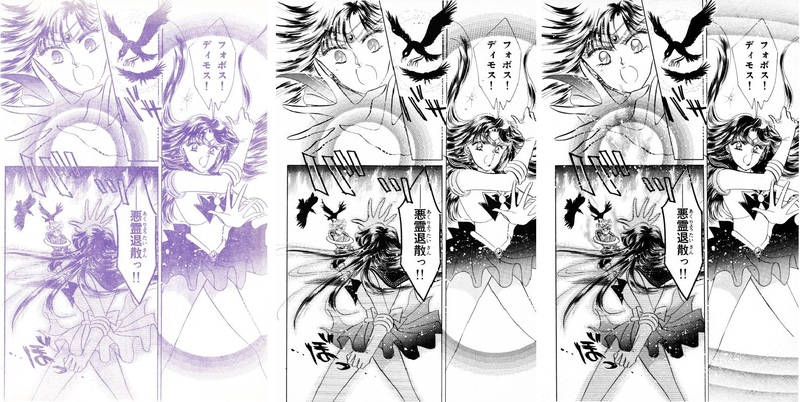 For some bizarre reason, the Mar symbols were redrawn in the Remastered edition, in addition to a change to Luna’s design in the top-right panel, some glow-y balls added around the transformation pen, and the glowing circle around Rei’s pen being enlarged and changed. Also, for some odd reason, Ami’s arm was removed (moved down to be covered by her body?) in the lower-right panel. Honestly, it looks unnatural in the Remastered version compared to the Original. 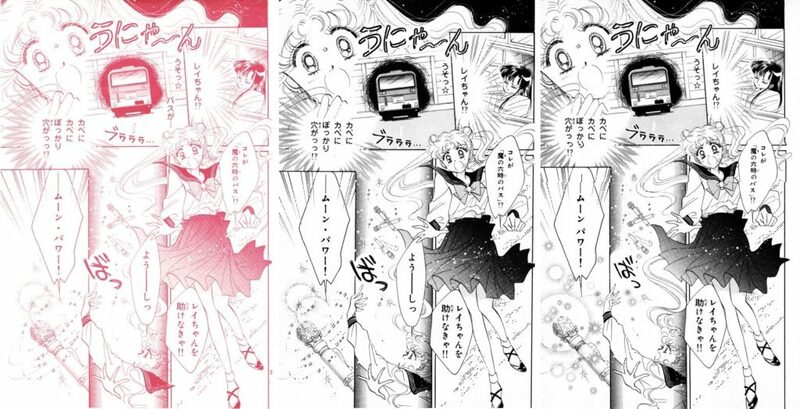 So, one small change after the Nakayoshi version: Rei’s skirt has had some shading added in the bottom-left cell. Looks like mostly cleanup edits on this page from the Remastered version. Luna’s ears are made smaller in the middle panel, with her right (reader’s left) ear now being cut off by the top border. 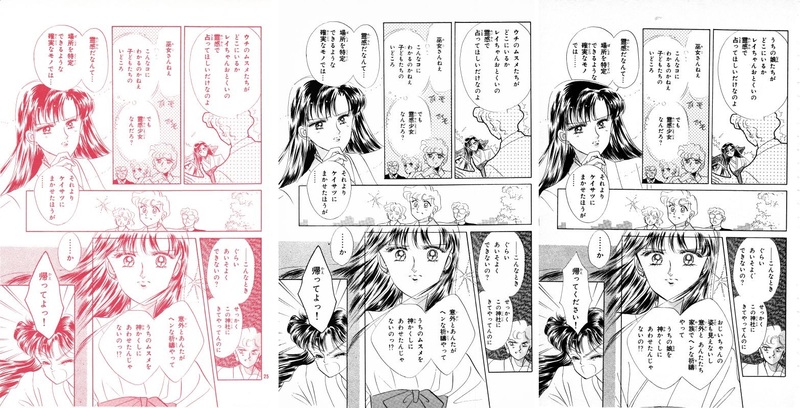 In the lower-right panel, the Sailor Soldiers and the girls they’ve saved have been moved lower and designs touched up. In the lower-left as well, the girls’ designs are again cleaned up. As mentioned above, there was no equivalent in the Nakayoshi release. 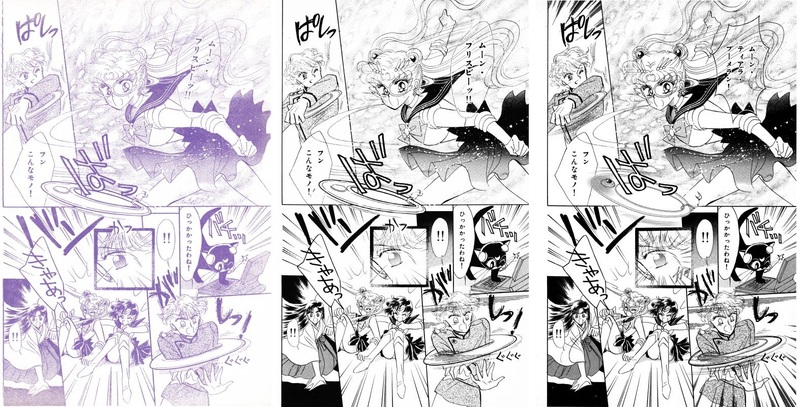 However, there are a few differences from the Remastered edition, such as Luna and being redrawn in the top-right panel in addition to Usagi’s mouth being re-touched along with her bangs in the upper-right, the Mars symbol being redone and shading added to her bow in the top-left panel, and the three Soldiers being cleaned up and distorted to look like they’re magnified in the crystal ball in the middle panel. And that concludes my review of Act 3, the third chapter in the story of Sailor Moon. I hope you enjoyed it! This content is available one month in advance to Patreon subscribers, who help make this and other content on this site possible. If you’re interested in knowing more, please check it out! ← Does Sailor Moon Have a Connection to the Paranormal? 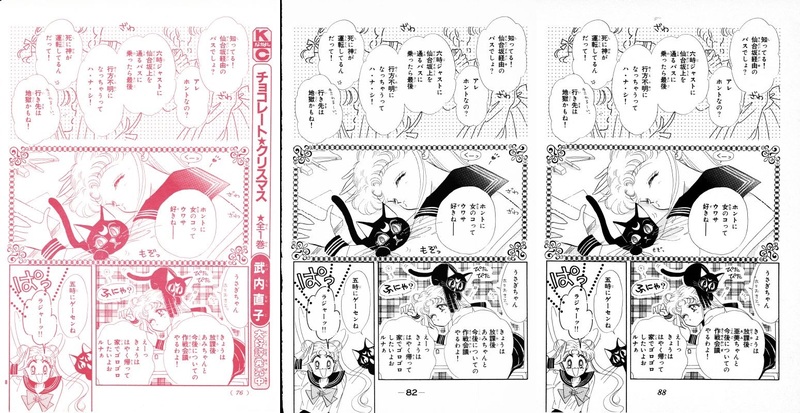 Page 8 you missed a change: the remaster has changed the shape and position of Usagi’s bottom lid in the bottom right panel. It’s now closer to the edge of her face and longer. Sorry it took so long to get back to you — finally was able to dig this comment back up. The page has been updated. Thanks! Hi, love all your hard work, glad to be a Patreon. 🙂 I’d like to know, is there anywhere possible to see translations or scanlations of these small Naoko notes? 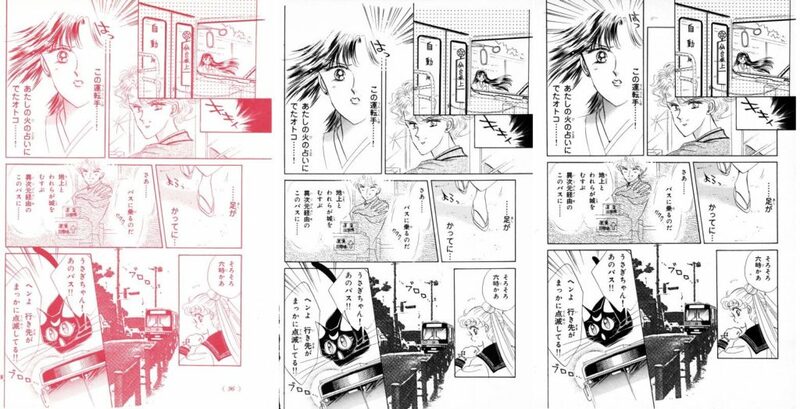 (Page 11) I only seem to find these http://shojopower dot com/naokos-notes/, scanlations I find are from the remaster edition. Thank you for any info!